Chaweng bech yesterday in front of Centara Grand Beach resort, not your typical view of the beach during November with nice and sunny weather and no waves to speak of! Hope you enjoyed it. Yesterday saw a lovely day around Koh Samui with very untypical November weather, it was sunny and warm all day long just towards the end of the day time light some clouds moved in but it stayed dry and the max temp reached a stunning 33C, keeping in mind that we're in November and on koh Samui! Yesterday's sunset over Kata on Phuket, saying goodbye to a warm and sunny day with the high season about ready to start up here on Phuket. The forecast is sticking to it's prediction and the monsoon is about to knock on Koh Samui's pretty hard. If the forecast is correct, we will see the arrival of rain later this morning around the islandnand it will stick around for at least the enxt seven days, bringing in real monsoon like conditions with rain pretty much all day long and a stiff breeze or at times very hard wind. It may be difficult to get your laundry dry in these conditions. Hang in there, batter the latches and tomorrow could see a very wet start of December 2016! It's time to say Goodbye to November 2016 since this month is walking on it's very last legs with just one more day to go. It was a very good month. considering that we could have been in the middle of the monsoon period. As expected, there was indeed a fair bit of rain, but nothing like a monsoon period can be with non stop rain for a couple of days in a row. From that point of view it was a real good month and we had more sunshine than I would expect in general during November, especially the last couple of days have been real nice. That is about to change though and later today we may get a real monsoon or rainy season weather pattern with rain non stop over about a week. December may start tomorrow on a very wet foot! Goodbye to November 2016 with a lovely November sunset on one of Koh Samui beaches. This may well be near Big Buddha, where I know that there is such an unusually shaped coconut tree. This month saw me only at home for about a third of the month, with the beginning and end of November being on Phuket for various PADI IDC programs. 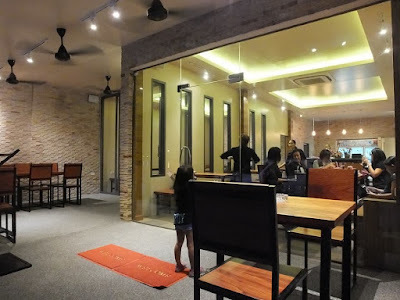 When I was home we went to the newly opened Kobori Japanese Restaurant in Nathon and enjoyed once more excellent Japanese food. Am looking forward already to the last month of this year 2016, December and the first couple of days will still see me on Phuket, just to go home for a day or two and than move over to Koh Phangan for a PADI IDC there, before Christmas I should be home again tough and be able to spend time with the family. Stay tuned and keep checking in, goodbye for now though but hope to see you back next month, browsing through the pages! The Seatran pier in Nathon viewed from a drone. When by car, this is our preferred arrivel or departure point. Seatran offers confortable ferries and a reliable service. Early next week I should be arriving once more at this pier. Chilli's at a market in Kata on Phuket at Patak road. How spicy can you eat Thai food? Did you know that how smaller the chilli, the spicier they get? The forecast remained the same and that means that the last November day of this month should more or less indicate the start of the rainy season. As of tomorrow the rain should start, tomorrow night the wind picks up and it's pretty much non stop rain from there onwell into next week. Enjoy today's sun, tomorrow we could have an almost non stop week of rain starting tomorrow. 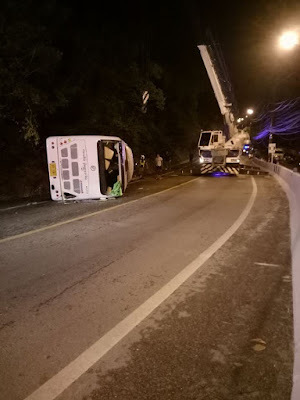 Yesterday evening a tourist bus overturned on Koh Samui roads with 28 people on board, when the driver of the bus lost control as the vehicle negotiated a curve, causing the bus to topple over on its side. Ten of the tourists were slightly injured, the driver, tour guide and the remaining 18 passengers were unharmed. Six of the injured tourists were sent to Bangkok Hospital Samui and four others were taken to Thai International Hospital Samui. Luckily nobody died. 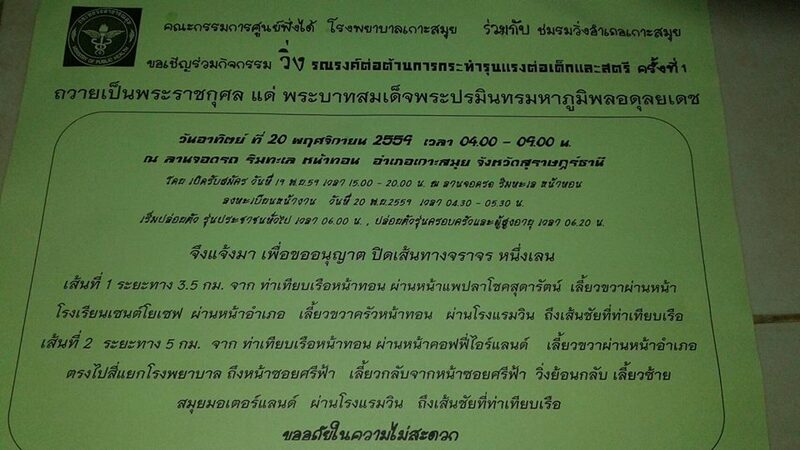 It looks this happened in the Baan Namuang area. Yesterday was a bit of a mixed bag, sunshine, clouds, some rain, back to sunshine and so on. On top of that it reached a max temp of 33C, not bad at all for a November day on Koh Samui. On the way to work in Kata, Phuket each day, less than a ten minute walk from my room to the Kata Big Rock training facility of PADI CDC Center ' Dive Asia', I pass this old jeep, parked in the green and grown under by the green in the garden. You can pass it a lot of times before you actually notice there's a car in the garden! 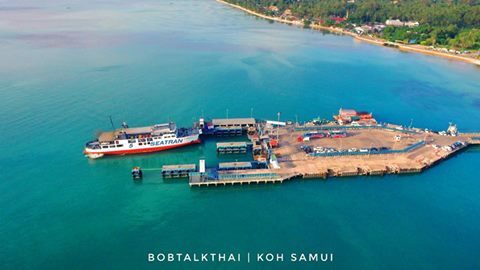 The foreast tells us to enjoy today and tomorrow, it may be the last two sunny days around Koh Samui for a while to come. As of Wednesday the rain and wind are supposed to pick up and by Thursday we should have strong wind and lots of rain pretty much all day long and this could easily continue well into next week. It looks like the monsoon is about to start, for real this time. 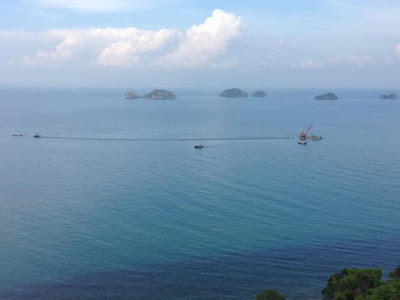 At Kata on Phuket it's a bit more cloudy but dry, nice running weather, this morning at 6am I run a 10km charity race at Bang Wad Dam in Kathu and it was 27.6C, nice and cool for me. I placed 6th in my age category in the fastest time I have run so far at the 10km distance. Happy days. The PADI IDC for November - December is also in full swing and in a moment we will continue with that, just an hour than usual. The forecast hasn't changed much for the next seven days but rather confirmed once more that the monsoon is knocking at Koh Samui's door and pretty hard it seems. As of Monday the rain and wind should start and will increase each day, reaching a momentarily crescendo come Thursday when there should be strong wind and lots of rain all day long and that seems to continue for a few days at the moment, well into next weekend. 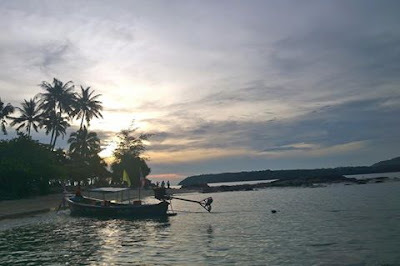 Enjoy those last sunbeams, it may be a while before the sun wills et it's sights on Koh Samui again in the near future. Yesterday the current PADI IDC for November - December on Phuket was for the first time at full strength and we're already well on our way to hit the half way mark soonish. 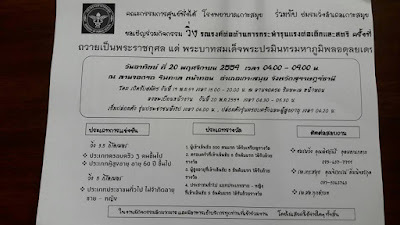 Tomorrow I'm planning to run a charity event race, the Run to Give race at the Banwad Reservoir Dam in Kathu, which is also held onm Koh Samui tomorrow morning at the Wharf, after which I have to go straight to work. Tomorrow's update therefor may be very late. 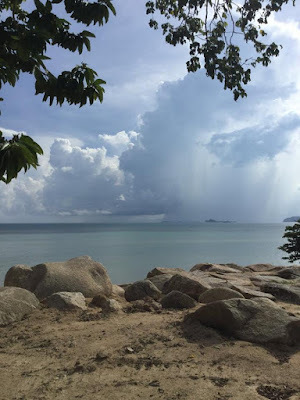 A picture catching yesterday's mood around Koh Samui perfectly, sunshine with rain in the background, taken at the beach near the Centara Villa Samui in Hua Thanon, at the far South Eastern corner of the island just South of Lamai. 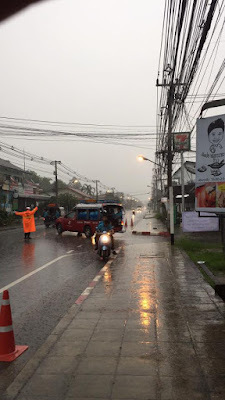 The forecast is predicting some serious monsoon weather as of mid next week, with pleanty o rain and fairly strong wind, preceded by two wet days, Monday and Tuesday but without the abundance that is expected later next week. Enjoy all the sunshine you can get at the moment since it seems that it will be soon a thing of the past for at least a few days and in the worst case scenario a few weeks. 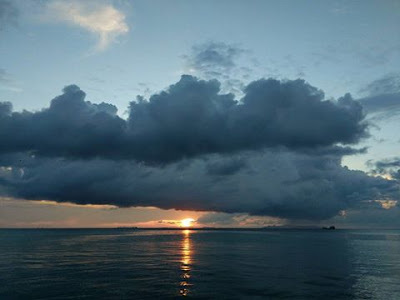 The monsoon seems to be on it's way direction Koh Samui. A 'holy' tree on the causeway to Big Buddha. Many trees in Thailand are considered holy but I'm not sure what criteria are being used to declare them holy or hwat makes a tree qualify. However, this tree can surely proof it's a holy tree and each day somebody comes and changes fresh water bottles and possibly some food to appease the ghosts in or around the tree. Yesterday saw a lovely and sunny day around Koh Samui without any rain and still a very nice max temp of just 31C A lovely and great November day! The forecast for the next seven days has undergone some drastic changes and not winter is coming on Koh Samui but most likely the monsoon will make it's grand entrance by Tuesday when plenty of rain is predicted, but as of Wednesday even more rain is predicted combined with very strong wind and high waves. Time to start bracing yourselves and batter the hatches down but in the meanitme, still enjoy this coming weekend and Monday! Just about two weeks ago, Kobori, Japanese restaurant in Nathon opened it's doors and last weekend we visited for the first time. The menu is the same as in Kobori, Japanese restaurant in Maenam and the quality is at the same high level. We enjoyed all the food that was served during the evening and it was a lot, since we were with a relatively big group, 5 adults and 7 children. 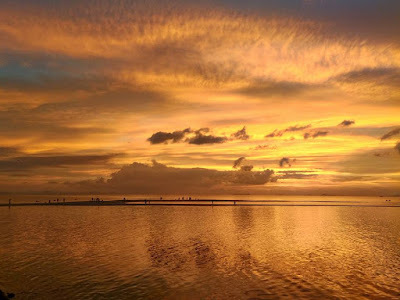 The location is very good, at the beginning of the one way boulevard in Nathon, with a great view over the ocean with spectacular sunsets during the last afternoon or early evening. Kobori, Japanese restaurant in Nathon; View from the outside, where you can find tables for an outside dining or lunch experience, whilst inside everything is airconditioned. It was surprisingly busy and I think that many people living in Nathon and nearby are checking out this new restaurant option in their neigborhood. I'm sure that many of them already heard from word of mouth about the quality of the Maenam restaurant. Kobori, Japanese restaurant in Nathon; Inside in one of the two connected rooms, but seperated by a door. Everything is nicely decorated, simple yet very effective and enjoyable. 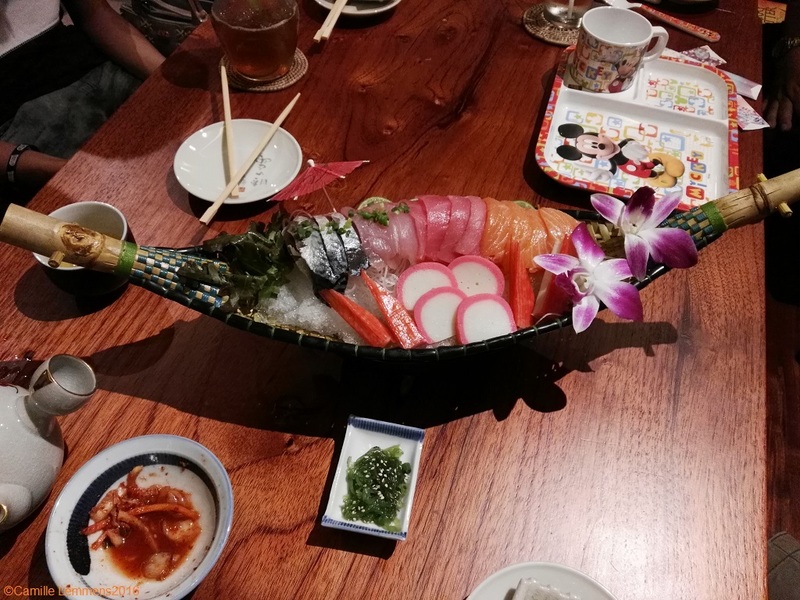 We ordered lots of food, being with a fairly big group and some of our favorites came along again, like the sashime, as pictured below but also a Tepnyaki set and a avocado salad with s slightly spicy wasabi sauce or how about a ramen pork soup? Anybody for a California roll or other assorted sushi? Some tofu agedisha? As you see, we had our fun and it was all very good tasting, as we are used to by now from Kobori. there's a reason why it's one of our fave restaurants on the island. 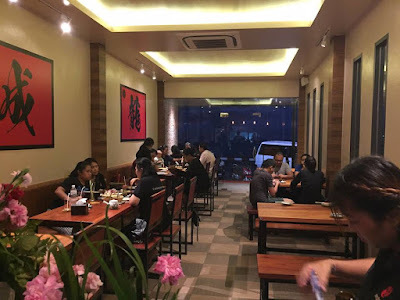 There's a different vibe in the Nathon restaurant compared to the Maenam restaurant but the food is definately of the same quality. From where we live, it's a lot easier to visit the Maenam restaurant but it seems that plenty of friends prefer the view of the Nathon place. For most of us it's little further out of the way but well worth the extra time and effort. Do find out for yourself and pay them a visit. 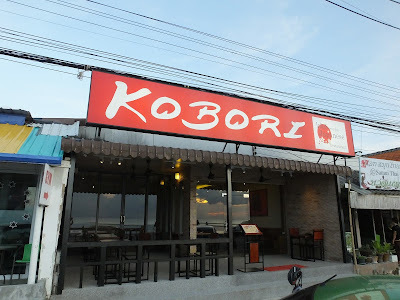 Hope you enjoyed this review and please let us know what you find of Kobori, Japanese restaurant in Maenam and Nathon! 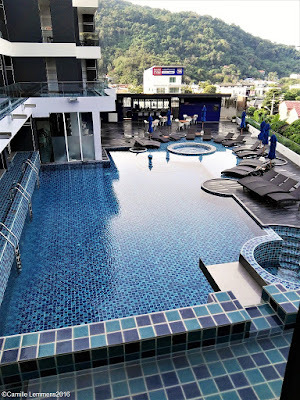 The On On Hotel in Old Phuket town on Phuket, which became famous during the filming of the movie 'The Beach' back in 1998, when Leanordo Dicaprio stayed here in room 204. 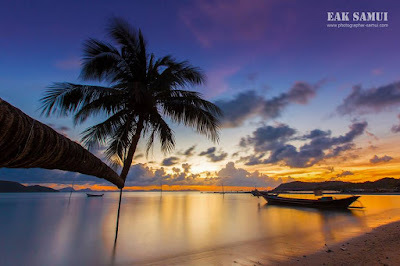 I stayed on Koh Phi Phi back in those days, completing my PADI Divemaster course and occasionally we saw the film crews and the like go over to Maya Beach near Koh Phi Phi where they were filming parts of the movie. Back to Old Phuket Town though, a very interesting part of Phuket and well worth a visit just to stroll around, enjoy good local food and take some great pictures of Old Phuket Town's Sino-Portuguese buildings on both sides of the street. The forecast for the next seven days hasn't changed that much, cloudy to partially cloudy each day with likely some showers and come next Wednesday the wind should pick up with steady rain starting on next Tuesday. It looks like the monsoon or rainy season is about to start to knock on Koh Samui's door. Talking about yesterday, the PADI IDC Staff course for November - December started yesterday and today the PADI IDC will kick off. Looking into Soi Green Mango, where the nightlife of Chaweng partially takes places, with various girlie bars and discos. It seems to be a dwindling affair and doesn't seem to be as busy as it used to be, more and more bars are disapearing but I hardly ever frequent these places anymore and only see them occasionally during the daytime. Near the Reggae Pub, or rather the street leading to the Reggae Pub is another nightlife area of Chaweng where you can find plenty of the so called girlie bars. Patak road in Kata on Phuket in the early morning with a Baht bus parked by the side of the road. 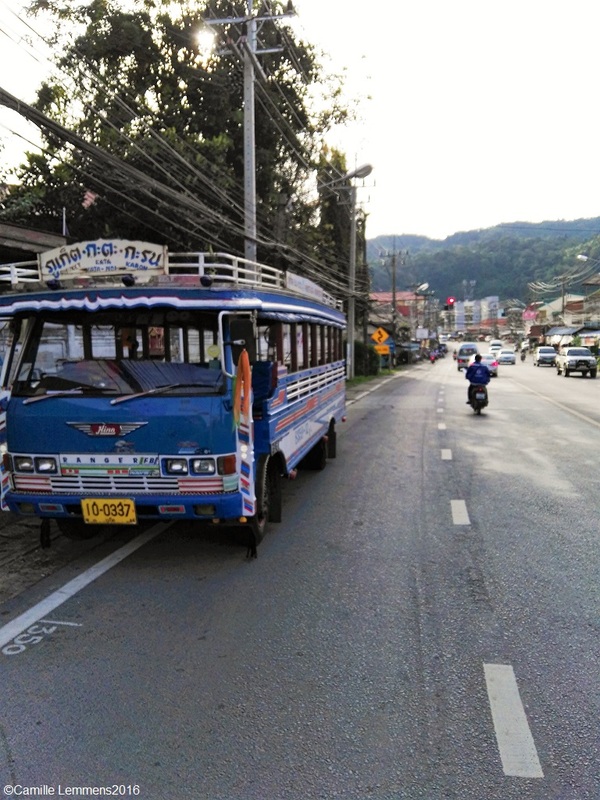 This particular bus connect Phuket town via Kata to Karon and can be found on many different places in the busier parts of Phuket, covering and driving different routes. 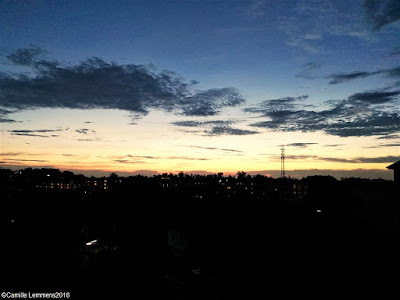 The forecast for the next ten days predicts a cloudy to partially cloudy sky with a good posibility of the monsoon make it's grand entrance after the weekend when as of Tuesday the clouds may become thicker and greyer, more rain is expected and the wind is supposed to pick up as well. Enjoy the last week of good November weather, it looks like it's about to change soon. Yesterday afternoon I arrived back on Phuket, where I will be starting a PADI IDC Staff Instructor course today and a PADI IDC program tomorrow. Young rubber tree plantation in the mountians somewhere between Maenam and Bophud. The nature and views in the hills on Koh Samui are stunning and well worth a visit, however, if you decide to go there, don't get lost, bring plenty of water and make sure if you take wheels, that they can handle the terrain! Other than that, enjoy!! Busy main raod in Patong on Phuket. The contrast can't be any greater with the picture of the Koh Samui hills! Yesterday I arrived back on Phuket, within less than two weeks having been away and I'm glad that I will be in Kata again this time around. 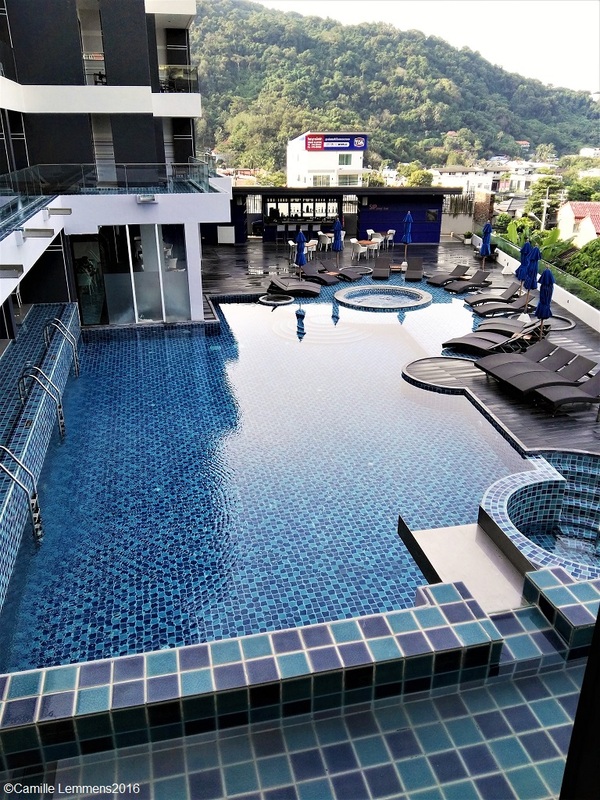 Patong is just too busy and touristy for my liking. The forecast for the next seven days has changed slightly again, cloudy to partially cloudy until Friday and after that a lot more sunshine is possible and overall during this seven day period, a lot less rain is predicted. Enjoy this mild November weather and each sunbeam that may come your way. Today I will be on my way to Phuket again, starting a PADI IDC program on Wednesday and a PADI IDC staff Instructor course tomorrow. Another great shot of Meh Guan Ihm at Wat Plai Laem or Wat Laem Suwannaram, although this time around it's not my own picture. If on Koh Samui, make sure to pay a visit, you won't regret it with the many fantastic looking buildings and excellent photo opportunities. Big Buddha, which is part of the same temple complex and administered by the same monks, is just around the corner as well. The forecast for the next seven days keeps looking good, partially clouded skies with some rain expected come Wednesday and Thursday. Keep enjoying this rather good monsoon weather as long as it lasts. The Meh Guan Ihm statue at Wat Plai Laem or Wat Laem Suwannaram, on a much sunnier day, almost five months ago. It is one of the most beautiful temples on the island in my humble opinion and well worth a visit, displaying some unusual statues and photo opportunities. It's just around the corner from where I live and it's the neighborhood temple for us. The forecast for the next seven days predicts partially clouded skies to cloudy skies with an occasional shower. Still fairly good conditions for this time of the year when we could or should have a monsoon on us. The forecast for the next seven days predicts a mixed bag with partially clouded skies and regular showers. It's starying to look a little bit more like a rainy season should but still a far cry from what a real monsoon looks like. Charity run to raise awareness for women and children abuse in Nathon Sunday 20th November with the route described as being at the Nathon ocean promenade. 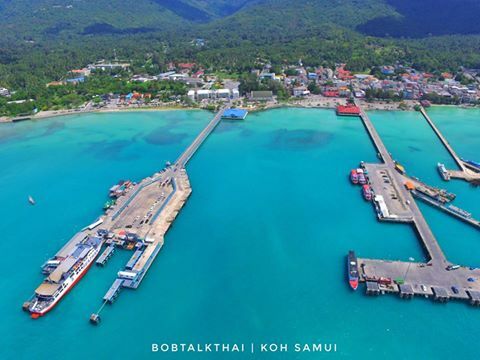 Regular Samui runners will know here to look, most likely start and finish are expected to be at the pier in Nathon in front of the post office. Charity run to raise awareness for women and children abuse in Nathon Sunday 20th November with a 3.5km and 5km distance with start at 6m. Registration can be done in Nathon on Saturday 19th November between 3pm and 8pm or Sunday monring between 4.30am and 5.30am. A lovely sunset in Nathon, in front of the enwly opened Kobori Nathon Japanese Restaurant where we will be visiting tomorrow to witness hopefully a similar beautiful sunset and to enjoy good and tasty original Japanese food, in my humble opinion, the best Japanese food on the island. A report will be up soon. The forecast for next week has changed slightly, predicting plenty of rain today and tomorrow with partially clouded skies afterwards and occasional showers being an option at all times. It's still not a full on rainy or monsoon season but we do tend to get our daily showers, albeit rather small ones at the time being. The forecast has changed slightly for the next ten days, fairly cloudy with a bit of rain until Monday when the cloud layers should be lifted for most part with occasional showers. Still looking fairly good for a November week. The forecast for the next ten days is still looking good, cloudy to partially cloudy and an occasional shower. Very good conditions for the rainy season that we are in right now. 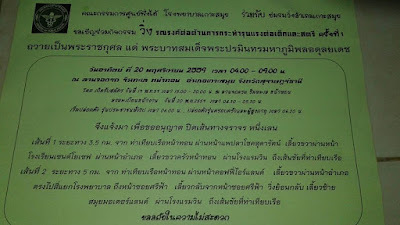 Loy Kratong 2016 was held yesterday but it was a close call, since intially all events were cancelled after King Bhumibol Adulyadej's passing awau but just in the nick of time, it was revealed that all events could actually happen after the one month mourning period and Loy Kratong 2016 just fell one day after the 30 day mourning period. It was supposed to be a toned down version without fire works or other typical party like activities and it was indeed a very subdued affair yesterday at Wat Plai Laem or Wat Suwannaram. Not a big event, still a few people were there, but we just went to float our Kratong, walked around the temple and paid respect to our deceased parents and went back home again. 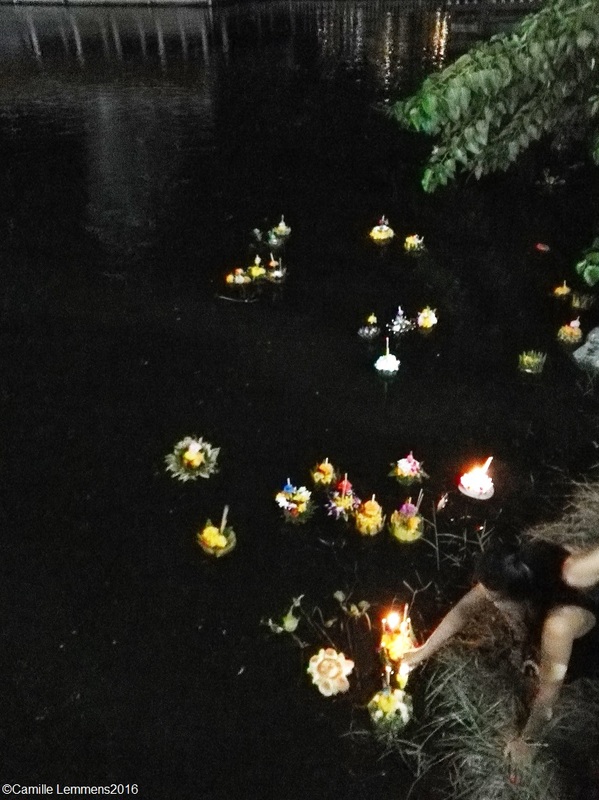 Loy Kratong 2016 yesterday at Wat Plai Laem, some of the Kratongs or floats floating at the lake around the temple. Many events are suppsoed to be toned down now, but I wonder how that may actually work out, like yesterdays Full Moon party on Koh Phangan, how can one tone down usch an event? Either way, it was good to be back home on Koh Samui and be able to enjoy this event with my family which is not each year the case. 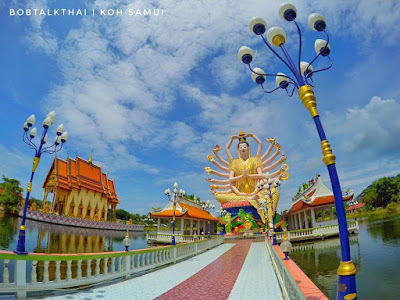 When you were on Koh Samui, the most popular place to float your Kratong yesterday was at Chaweng Lake, where it was very busy, just like all recent years. Surprisingly, all kratongs or floats were already cleaned early this morning. Slowly things are getting back to normal around Thailand, there are still eleven months of mourning laying ahead of us, but things aren't as strict as during the previous thirty days. Hope you enjoy your stay on Koh Samui or somewhere else in Thailand. 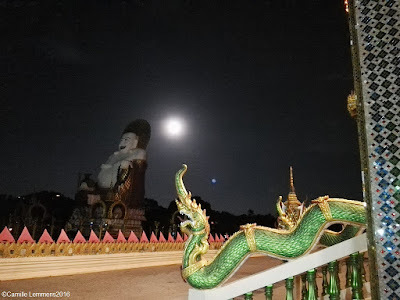 Super full moon yesterday evening at Wat Plai Laem during the Loy Kratong festivities. The moon did look bigger than usual, although supposedly we are not able to see it with our bare eyes. 12% bigger than usual, that's something, and brighter on top of that. 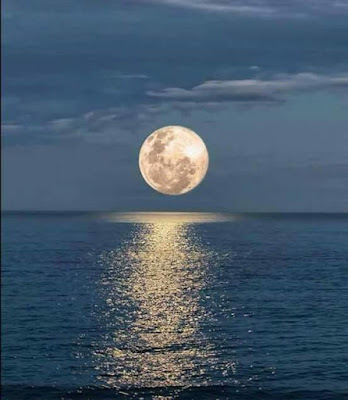 It's been 68 years since the moon was so close to earth and it will take another 18 years before this phenomena will happen again. 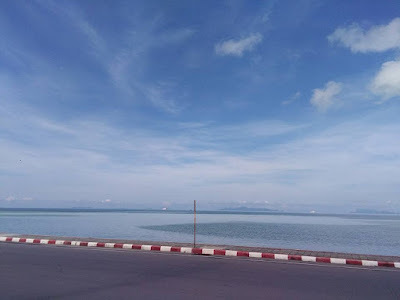 The forecast for the next ten days around Koh Samui didn't change much, it should be partially cloudy with plenty of sunshine and an occasional shower, except this coming weekend may have some more rain. Very untypical for a November, it should rain and the island needs the rain, to replenish the ground water levels. Still a month to go to get some more rain before the rainy season or monsoon should be 'officially' over. It's abit hazy this morning but overall there's a blue sky ruling over Koh Samui and no rain is expected today. Current temp at 7am is 26C and a warm day seems to be in the making. 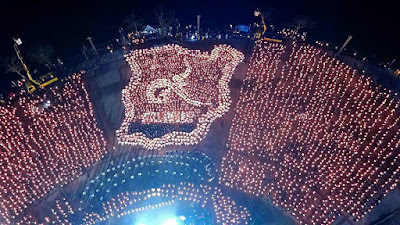 Koh Samui's tribute to King Bhumibol, yesterday at Phru Chaweng or Chaweng lake, during the super full moon. 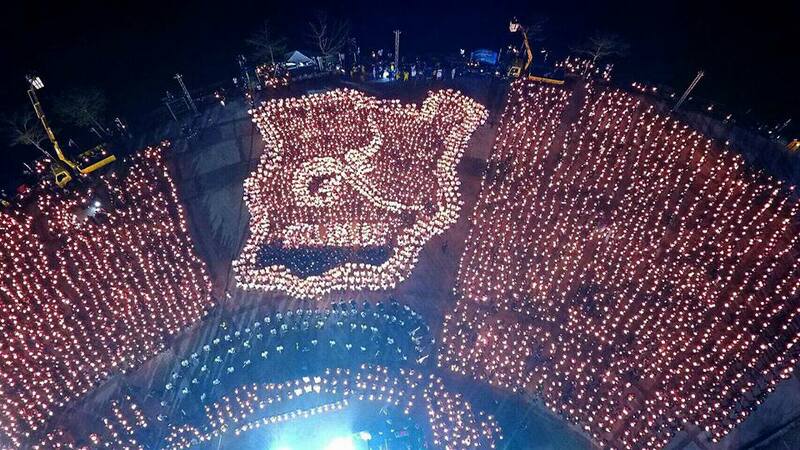 Similar tributes are being held throughout Thailand and Koh Samui couldn't and shouldn't be left behind. 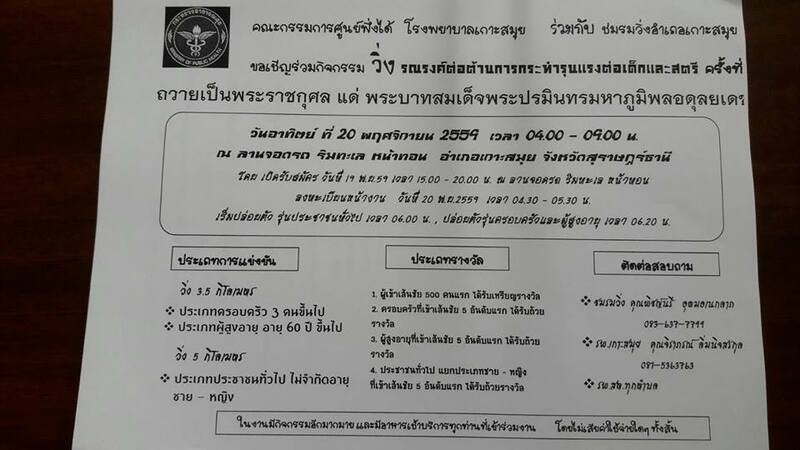 The logo you see is the Thai numeral '9' and below it is written 'Samui'. All day long practice and setting up this choreography proceeded this picture! 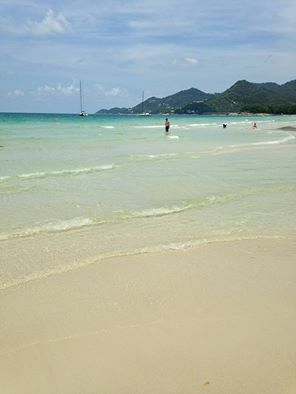 The forecast is looking surprisingly good for a November, when the monsoon is supposed to visit Koh Samui. For the next ten days expect blue skies accompanied by a very rare shower. Not exactly monsoon weather conditions. The forecast for the next ten days is looking good, plenty of partially cloudy to sunny days are currently predicted with occasional showers. Between Thursday and Saturday it could be really sunny and hot! Let's see and wait how that develops since it will be very unusual monsoon weather. 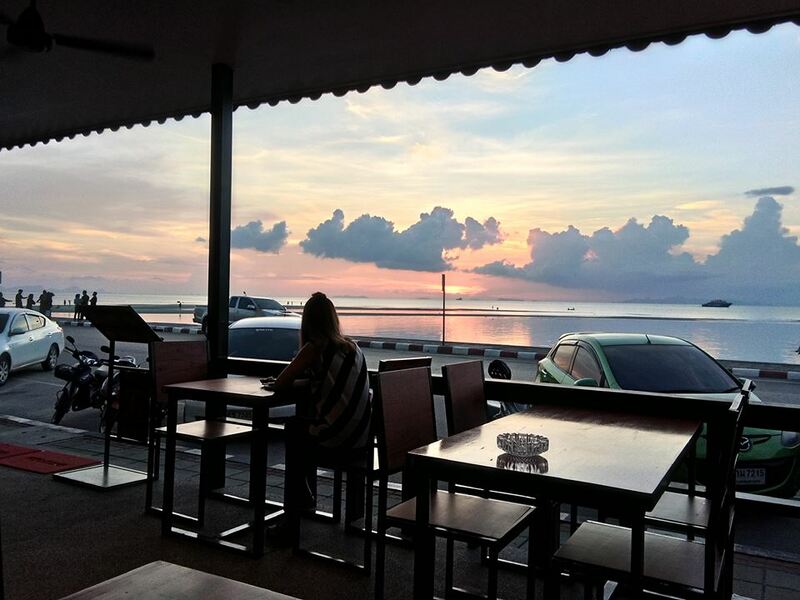 Sunset in Nathon, as can be seen from the newly opened Kobori Japanese restaurant in Nathon, at the ocean promenade. Great Japanese food with a lovely view. A great follow up from the Kobori Japanese restaurant in Maenam. The forecast for the next ten days predicts partially cloudy skies with not too much rain and possibly more sunshine than can be expected during a typical November. The rainy season currently seems to be far away. A sign at Big Buddha, pointing out limitations in using drones, it seems you need a license before you can operate one, which seems to be a good idea. On the other hand, drones can get some stunning pictures from areas that you seem to know well and they sometimes add a nice and new perspective. The forecast for the next ten days didn't change much, partially cloudy skies with a fair chance of rain. Not too bad of a prediction considering we're in the middle of the rain season time frame.